Starting Monday, July 12th, JPT Scare Band and Ripple Music will be auctioning off the only available original test pressing of Acid Blues is the White Man’s Burden. This is the only copy that will ever be made available to the public, and it is only being done to benefit Gulf Coast Relief. Follow the link below to take part in the auction for this rarest-of-rare-piece of JPT Scare Band history, help out a worthwhile cause and help the band stick it to BP Oil one more time. And while you’re at it, check out the video for “Not My Fault,” leave your thoughts, and pass it on to your friends. 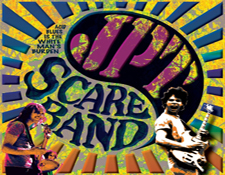 JPT Scare Band will be White Man’s Burden in CD, digital and deluxe multi-colored double 12″ vinyl formats. LP edition will include two previously unreleased bonus tracks. The album will be available world-wide through the Ripple Music Store on June 22nd, 2010. Legendary rockers, JPT Scare Band, released some of the most collectible psychedelic/acid rock of all time. Banded together during the tumultuous years of the early 70’s, JPT Scare Band fused a sound equally heavy in hard rocking blues as it was tripped out in psychedelia, creating a sound so imposing that it perfectly reflected the emotions of the era.